In the fight against shale gas drilling, it seems all roads lead back to a low-slung brick building in Ithaca, N.Y. Inside is the office of the Park Foundation, where a staff of eight has underwritten the rock stars of the anti-drilling movement. Josh Fox, maker of the Oscar-nominated anti-drilling documentary "Gasland," got $175,000. Robert Howarth, the Cornell University professor whose research first questioned the belief that gas is cleaner than coal, got $35,000. Duke University professor Rob Jackson got $50,000 to continue his work on methane in drinking water. The following figures are provided by the Park Foundation. The Park Foundation reports that it awarded $17.8 million in total grants last year, $3 million of that for environment programs. By comparison, the American Petroleum Institute spends more than $180 million a year total, including $3 million for grants and $56 million for lobbying in 2010, according to its public tax return. And American Clean Skies Foundation, a nonprofit founded and funded by Chesapeake Energy Corp. CEO Aubrey McClendon with a $13 million budget, has announced a program that will award $1 million in grants "to underwrite the production and distribution of original TV, film and Web content" on energy issues. Cornell, a leading recipient of Park's largesse, has emerged as the academic bastion of resistance to shale drilling, or "fracking," as it is often called. And New York state, where Park focuses its grants, has put up more resistance to the shale boom than any other state. A de facto moratorium has kept rigs out of the state. "In our work to oppose fracking, the Park Foundation has simply helped to fuel an army of courageous individuals and NGOs," or non-governmental organizations, said Adelaide Park Gomer, foundation president and Park heir, in a speech late last year. Since 2008, the foundation has given at least $2.8 million to groups and publications fighting shale drilling, showing that drilling opponents do have financial backing. "You realize there's got to be money coming from somewhere," said Dan Fitzsimmons, president of the Joint Landowners Coalition of New York, a pro-drilling group, "but we never dreamed of anything like this." Critics say the real total is closer to double the $2.8 million figure, and accuse the foundation of understating the amount of money it's putting into the fight. No matter what the total, it's far less than the millions of dollars oil and gas industry groups spend to influence policy and public opinion. But the outsized influence of Park's seed money has infuriated some in the drilling industry. "Park funds headlines, pure and simple. It funds activities most likely to generate the most attention in the press," said Chris Tucker, spokesman for Energy in Depth, a project funded by oil and gas companies to fend off expanded federal regulation of drilling. "It doesn't fund the hard stuff, the time-intensive, rigorous stuff. And that explains why they're able to do what they do on only a couple million dollars a year." Such criticism has meant a lot more scrutiny of a charitable institution whose experience with national exposure had been confined mostly to mentions at the end of PBS programs. Park's supporters and grant recipients say adversaries are peddling conspiracy theories to cast industry as the underdog. "There's a narrative about Park's agenda that there's some conspiracy to influence public policy," said Jackson, whose grant will fund baseline testing of water in upstate New York. "It's an attempt to dismiss work funded by them, to say, 'Oh, it's a Park project, so we can ignore it.'" Jon Jensen, the foundation's executive director, acknowledges the heightened criticism. He says the organization has tried to respond by being more public about its affairs. But he says Park has been responding to concerns in the upstate New York community it serves. In Ithaca, "it's probably hard to find anyone who supports fracking," he notes. "The industry has tried to characterize the foundation as special-interest money," he said. "But we're responding to what's coming at us." Gomer is the daughter of Roy Park Sr., who built a media empire from the money he made promoting the Duncan Hines food brands. When he died in 1993, Park Communications controlled 21 radio stations, seven television stations, and 144 newspapers and other publications. Forbes magazine estimated his fortune at $550 million and ranked him 175th richest in the country. He created the Park Foundation in 1966 to support programs in communities where his company had interests. When he died, Park bequeathed more than 70 percent of his holdings to the foundation. Park Communications was sold to Media General. The foundation's endowment, buffeted during the recession, now stands at about $300 million. For the past few years, the foundation has spent $17 million to $20 million a year on philanthropy. The lion's share of that money goes to education -- scholarships and other funding at Ithaca College in Park's hometown of Ithaca, and his alma mater, North Carolina State University. Another foundation, spun off in 2002, now handles scholarships at Cornell. Park also puts significant money every year into media -- NPR and the Society of Environmental Journalists have gotten money -- in addition to the academic and environmental grants. But the foundation's focus increasingly has become the fight against drilling. Drilling rigs have roared across Pennsylvania as companies rush to tap the Marcellus Shale. They haven't been able to cross into New York, and Gomer wants the temporary moratorium made permanent. Gomer's speech last year was titled, "New York Should Become the First State to Ban Fracking." Fracking, short for hydraulic fracturing, is a segment of the drilling process in which crews blast millions of gallons of chemical-laced water deep underground at high pressure to break apart rock formations and release gas. Some, particularly opponents, use the term "fracking" for all aspects of the drilling process. Many of their concerns relate to aspects of drilling other than the specific fracturing process, such as truck traffic and wastewater disposal. Others have welcomed drilling as a boost for economic development and a chance for farmers and other rural landowners to cash in their gas rights for hundreds of thousands, even millions, of dollars. People like Fitzsimmons, whose organization represents thousands of families who want to lease their gas rights, say Park's grant-making is an example of wealthy, liberal donors blocking economic development in rural areas such as upstate New York. "They don't want to see any industrialization around their second homes," he said. Fitzsimmons recounts how he traveled to Ithaca to ask Park officials to fund an education campaign for homeowners interested in leasing. He wasn't surprised to be turned down. But he said he was surprised when Jensen told him rural landowners were "collateral damage." "Hearing that we're collateral damage wasn't pleasant," Fitzsimmons said. Jensen recalled meeting with Fitzsimmons and indicating Park likely wouldn't be interested in the education campaign. But he said he did not recall using the term "collateral damage" or taking that position about landowners. Gomer rejects the charge of elitism and the idea that opposition is simply a matter of "not in my backyard" thinking. "The opponents of this are not NIMBY, and the opponents are not wealthy," she said in an interview with EnergyWire. "They don't have second homes. These are people who have children. They're people who care about the beauty of New York state." Park's anti-drilling grants began in 2008 with one for $15,000 and grew to a little more than $1 million in 2011, by the foundation's count. But that total includes only the grants specifically targeted at anti-drilling programs, such as the $175,000 for Fox to do a tour showing Gasland to grass-roots groups (Park did not contribute to the making of the film). Park also provides less specific financial support in five and six figures to groups at the forefront of the anti-fracking fight in New York and nationally. The words fire quickly from the mouth of Adelaide Park Gomer as she explains the horrors of shale gas drilling, or "fracking." "I'm just totally opposed to it, along with just about everybody I know with a brain in his head," she said. Farmers' fields "will be a wasteland," she said. "Their animals will die." But there is a pause, however brief, when she is asked if her father, the late media mogul and philanthropist Roy Park Sr., would have opposed drilling, too. "I think he probably would have. My father loved the environment. I don't think he'd want to drink polluted water," she said in an interview with EnergyWire. "I think he'd be very proud of what we're doing." It is the fortune her father assembled that she, as president of the family foundation, has harnessed to take on the oil and gas industry. The Park Foundation gives most of its money for scholarships. But it has become a leading source of money for groups fighting shale drilling, particularly those trying to keep it out of New York. In the years after his death in 1993, but long before most anyone in upstate New York had heard the term fracking, there was a feud between Gomer and her brother, Roy Park Jr., about giving money to environmental and liberal causes. The tension could be seen in the foundation's grants. The foundation's 2001 tax return, for example, lists a $5,000 contribution to the conservative Heritage Foundation along with $139,000 for the Natural Resources Defense Council. Her brother laid out the dispute starkly, though without naming names, in "Sons in the Shadows," the 2008 autobiography he wrote about his strained relationship with their father. "Our foundation's grants were beginning to be based on barely concealed political activism, pessimism, criticism, radical environmentalism and other-isms," he wrote. "My father held conservative principles and as I said, my family will not be the ones who trample on his grave." By "my family," he meant himself and his two children. Gomer's daughter, Alicia Wittink, served on the board then and now. In the middle was their mother, Dorothy Park, the elder Park's widow. She decided to spin off a new foundation in 2002. In an affidavit quoted in The Ithaca Journal, Park Foundation board member Jerome Libin said the idea was to provide it with enough money "to support all of the programs Roy Jr.'s side had been supporting." Called the Triad Foundation, in reference to the trio of Roy Park Jr. and his two children, it has assumed some of Park's commitments to higher education at Cornell and North Carolina State universities. It also provides five-figure grants to Heritage, along with other traditional adversaries of environmental activists, such as the American Enterprise Institute and the Heartland Institute. In an emailed message, Gomer took issue with her brother's characterization of their father's opinions on the environment. "My father hailed from a farm family in North Carolina," she wrote. "His parents lived off the land and would never have wanted their property to be turned into a moonscape, despoiled by hundreds of toxic, unidentified chemicals. "My father's business was the media. He was not involved in assaulting the environment. He loved the outdoors. He lived in a home surrounded by lush vegetation and beautiful gardens and meandering streams." With Gomer at the helm of the Park Foundation, its donations outside the academic realm are more liberal, from the Humane Society to the Adopt-A-College program of Vegan Outreach. Gomer describes herself as a grandmother, a former teacher and a cancer survivor. She is also an executive board member of Defenders of Wildlife. According to a biography from Ithaca College, where she is a trustee, she taught reading and special education in school districts in the Ithaca; Rochester, N.Y.; and Richmond, Va., areas. She has also worked in public relations and advertising in New York and San Francisco. In the interview, she said her passions run more to "independent media" than stopping drilling, "but it drew me in because it's such a dangerous process." The country needs to move more quickly, she said, toward clean energy, and people need to change their energy habits. "We do not inherit the Earth from our ancestors. We borrow it from our children," she said. "The Earth and its resources are finite. We cannot use up our children's future." In a speech last year, she recalled her reaction when she learned how advances in a process called "hydraulic fracturing" would expand natural gas drilling in upstate New York and throughout the Northeast. "I felt somewhat like an Iraqi must have felt in reaction to 'shock and awe,'" she recalled. She is given to such attention-getting statements in pursuit of liberal causes. When the village near Ithaca where she lives considered responding to a deer infestation by shooting some, she told municipal leaders the plan would "turn Cayuga Heights into an annual killing field." While some might see such statements as bombastic, at least one has proved to be understated. In 2002, during the run-up to the invasion of Iraq, Gomer wrote a letter to the Ithaca newspaper arguing against war. Among her other points, she questioned the cost. "It is estimated that this war will cost as much as $200 billion," she wrote. "Where will this money come from?" American Rivers, which has received money from Park since at least 2002, has named Pennsylvania rivers the "most endangered rivers" for the past two years, citing drilling as the chief threat. Food & Water Watch, one of the most aggressive groups in the fight against drilling, got $150,000 to augment its $8 million annual budget, according to Park's publicly available tax return at Foundationcenter.org. Neither grant is tagged specifically in the foundation's tax documents as "anti-fracking." Industry and conservative critics see an interlocking web of connections that go unnoted amid stories about piles of cash from "Big Oil." Conservative commentator Jon Entine, in a piece posted on the American Enterprise Institute website, placed Park at the nexus of the "media-philanthropy-university complex." Park's grants to Common Cause New York -- $125,000 in 2009 and 2010 -- yielded three reports on the gas industry's lobbying and campaign contributions, which get prominent play in the state's media. Late last year, Common Cause New York gave Gomer its Civic Advocacy Award for environmental advocacy in the public interest. And an Ithaca credit union grantee in which Park invested $200,000 turned up in a New York Times story as evidence of financial institutions becoming fearful of lending to landowners with gas wells on their land. "As it turns out, source after source for the NYT series turns out to be Park Foundation-funded," Tom Shepstone, a campaign manager for Energy in Depth in northeast Pennsylvania, wrote on the organization's blog Feb. 14. Jensen said critics in industry have exaggerated the amount of money Park is putting into the fight. The foundation gives general operating support to numerous environmental groups, he said, and they take on more than just shale drilling. It also supports publications and media whose coverage includes drilling, but the foundation considers those to be separate from the anti-drilling grants. But the line can blur. Park gave $10,000 to the American Independent News Network for environmental coverage "with a focus on hydraulic fracturing." But it's not included in the list Jensen provided of anti-drilling grants. That list indicates that in four years -- from 2008 to 2011 -- Park gave out $2.8 million to fight shale drilling in New York and nationally. It doesn't include $60,000 to Clean Water for North Carolina Inc., which is circulating a petition to ban fracking in North Carolina, nor does it include $38,000 to Connexus Communications for the "A World of Possibilities" radio series on the impacts of natural gas development. 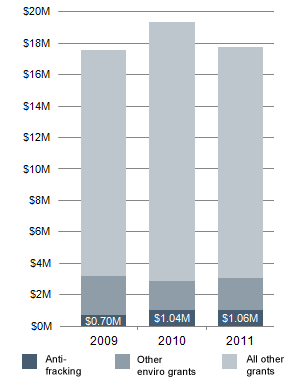 Adding up such other spending, Park spent $3.5 million against drilling in 2010 alone, according to Entine's article. But that figure includes grants such as $25,000 for a Michigan group to build support for "placing all water in the Great Lakes Basin in public trust" and the $100,000 Park gave to NPR for environmental coverage. Park's grant spending isn't hidden. The foundation, along with industry groups and most nonprofits, must list its grants and other finances on tax returns that are available to the public. Beyond that, Park provides more updated information about its grants at its own website. Jensen said that before the foundation got involved in the drilling debate, it had abided by the credo that "true philanthropy doesn't want to be recognized." But as the debate heated up, he said, the foundation realized anonymity could be equated with secrecy. "People can either assume the best or the worst," Jensen said. "We chose to be transparent." Even if Park's anti-fracking campaign has provided twice the official figure, it's far from a huge amount when compared to industry spending. The American Petroleum Institute, the industry's main trade group, spends more than $180 million a year, including $3 million for grants and $56 million for lobbying in 2010, according to its public tax return, available at Guidestar.org. The Independent Petroleum Association of America, which in 2009 created the Energy in Depth campaign that targets Park, spent more than $8 million on operations in 2010. IPAA spokesman Jeff Eshelman said EID's national budget was around $500,000 when it launched in 2009 and around $600,000 in 2010 and 2011. But the best comparison might be to the American Clean Skies Foundation, a nonprofit founded and funded by Aubrey McClendon, the outspoken chairman and CEO of Chesapeake Energy Corp. Clean Skies spent $13 million in 2010, including $6 million for its television outfit alone. But in December, Clean Skies all but scrapped its television operation. Foundation officials announced a grant-making program that sounds a little like Park's model: $1 million in grants "to underwrite the production and distribution of original, TV, film and Web content" on energy issues, "including feature-length documentaries and shorter subjects." "We expect this new grant program to stimulate a host of creative ideas and help us bring the foundation's messages to a wider audience," Clean Skies CEO Gregory Staple said in announcing the changes. "Movies can impact people's sense of what is possible like nothing else." This article was updated at 12:58 p.m. March 13.